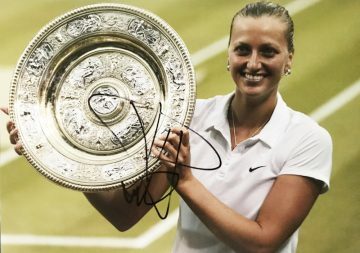 Shop signed Petra Kvitova memorabilia, including autographs on a variety of tennis related items. Signed Petra Kvitova balls, racquets, shirts and photos. Many with signing proof. All with free UK delivery, a Certificate of Authenticity and fast worldwide shipping! Formidable female tennis player Petra Kvitová may not be a household name worldwide – but her impressive track record and highly efficient play have placed her firmly in the tennis hall of fame. Kvitová was born in Czechoslovakia, now the Czech Republic. Inspired by Czech-American tennis legend Martina Navratilova, she took up the sport at an early age, training intensively in her hometown of Fulnek. At the age of 16 an instructor recognised her talent and encouraged her to pursue a professional career – a moment which was to become the start of an illustrious and highly successful presence in the sport. Kvitová’s junior career began in earnest in 2006 – slowly building her skillset and winning several titles before her Grand Slam title debut and breakthrough season in 2011. Aged just 28, Kvitova already has 25 career singles titles to her name – with two Wimbledon Grand Slam wins under her belt. She is the top-ranked Czech player and second highest-ranked left-handed player. She’s certainly one to watch – with many more games left to play and titles to win. Kvitova’s success is made all the more impressive upon learning of her various hardships over the years. In August 2015 she contracted mononucleosis, also known as Glandular Fever – but was cleared to compete and went on to secure her 17th career title. Later in 2017 she was attacked in her own home by a burglar who left her with nerve and tendon injuries to her left hand. Yet again she bounced back, returning a month ahead of schedule at the French Open. Browse and buy signed Petra Kvitova rackets, balls, caps, shirts and other memorabilia here at Firma Stella. Our fantastic collections autographed by one of the sport’s brightest stars. All 100% genuine, 100% authentic – provided with certification for complete peace of mind.